So what is Facebook advertising? Simply put, it is a way for anyone with a Facebook page to pay to promote their content to a specific group of people. The content appears in your Facebook newsfeed and looks like a regular post. But an ad is easy to spot. 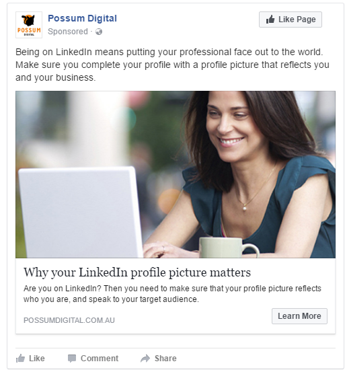 Here you can see that I have been served an ad from Possum Digital. The absolute give away here, is that the word sponsored is directly underneath the page name. If a piece of content has the word sponsored in this position, then it’s definitely an ad. This particular example is a single image ad. There are other types of ads – carousel ads, lead ads and right hand side ads – but to keep things easy, we’ll focus the rest of this webinar on the type of ad in this example. Just a quick side note on Facebook pixel – all a Facebook pixel is, is a piece of web code that allows Facebook to connect with your website. It helps you track conversions from Facebook ads, optimise ads based on collected data, build targeted audiences for future ads, and remarket to qualified leads— that is, people who have already taken some kind of action on your website. We’re now ready to create our Facebook Ad campaign. 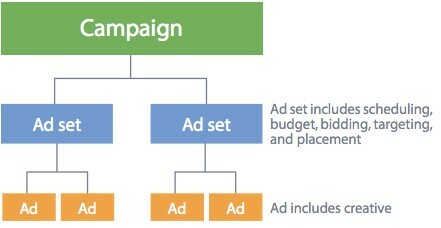 Firstly, setting up your campaign – this is where you set the objective for your campaign. Are you looking to convert leads to sales? Do you want to increase engagement? It is important to note that you can only select 1 objective for each campaign, so choose wisely. Next, we set up the ad set, where the audience is defined, budget selected and timing scheduled. With your budget, you can select a budget per day, or a total – or global – budget for the length of your campaign. Either way make sure you always have an end date! You can select your audience through demographic and also by what we call ‘interest’ targeting. For example, you can target women between 30 and 50 who live in Sydney and are likely to be business owners. And remember the Facebook pixel I mentioned about earlier? You can also create an audience of visitors who have visited your website. And the be even more targeted, ads can be served to people who have visited some pages on your site but not others, so for example, if people are visiting any of your blog pages, you can serve them an ad that drives them to a lead capture page. And lastly, the ad creative stage is where you create the actual post that will be seen. I recommend creating more than one ad so that you can test different images – image versus video – different written messages – or even test what call to action button works best. And remember, you ad is only going to be as effective as the landing page your send people to. The destination matters! At the end of any ad campaign, it’s important to look at the results. There is so much more we can talk about in the world of Facebook advertising, but I recommend setting up something simple with a small budget first, We’d love to hear how you go with your ad campaign! Feel free to drop over to our Facebook page and leave a comment there.